After last week’s sale of the Distillery Dinner tickets, we are now delighted to remind you all that tickets for the Springbank Open Day (Thursday 23rd May 2019) and the Cadenhead/Kilkerran Open Day (Friday 24th May 2019) events go on sale tomorrow at 2pm (UK time). 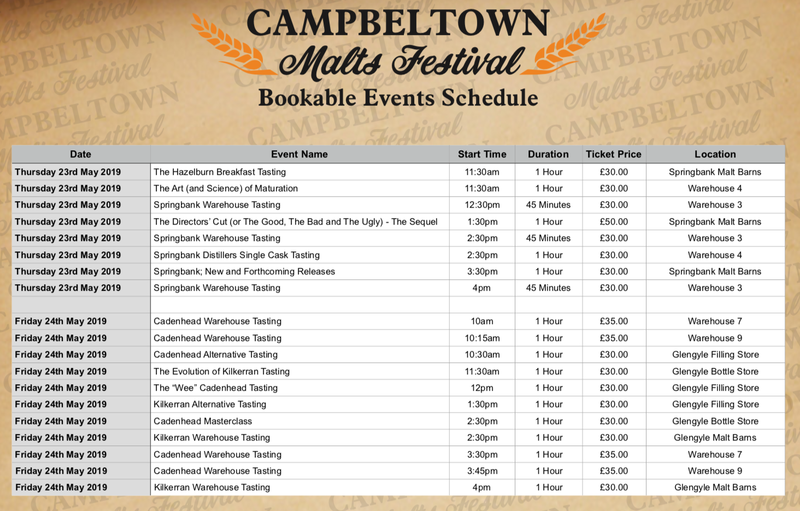 The Campbeltown Malts Festival 2019 is taking place between Tuesday 21st and Friday 24th May 2019. Tickets for Springbank, Glengyle and Cadenhead events taking place on Thursday 23rd and Friday 24th go on sale at 2pm (UK time) on Wednesday 13th February 2019 – that’s TOMORROW! If you are on the Eventbrite website before 2pm tomorrow, please remember to refresh your page as soon as the clock strikes 2 o’clock to ensure you are able to view the available tickets. Please note that once you have added the first tickets to your basket, you will have 12 minutes to complete the payment. If you fail to do this in the allocated time, the tickets will be returned to the site for sale. Please be aware that some events do overlap so make sure to check the start times and duration for each tasting/masterclass. Also, although we will try our best to stick as strictly as possible to the schedule, some events may overrun for reasons out with our control. We would also advise all attendees to allow themselves a break between tastings to drink some water or get something to eat. Also, please note that there will be a maximum of 2 tickets per person per event. Please remember to print off a paper copy of your tickets and bring them to the festival as they will be scanned upon entry to each tasting. Alternatively, you can download the tickets to your phone. Tickets for our Mitchell’s Glengyle Distillery Dinner (which went on sale last Wednesday) sold out extremely quickly and we imagine this will be a similar case for tickets tomorrow. The only tickets we have available for these events will be sold online so if you are unsuccessful in securing the tickets you seek, unfortunately there will be no option to purchase any directly from us. Once again, we will not be offering refunds or ticket swaps for our events. During the Springbank Open Day, we will have 3 events which are only bookable on the day so if you are unable to secure tickets tomorrow, there will still be the chance to get onto our ‘bookable on the day’ events. Tickets for these will be available from our marquee on the morning of our Springbank Open Day (Thursday 23rd May).